The CX series is an economical cooling solution, designed for cellar enthusiasts who are on a budget. CellarCool's cooling units ensure that the ideal humidity (50%-70%) and temperature (55°F-58°F) are maintained for the proper preservation and maturation of wines. All CellarCool wine cooling units are tested and calibrated to ensure their reliability, longevity and durability. Designed for simple through-the-wall installation, the unit fits between standard wall studs and the rear flange eliminates the need for a support shelf. The CX Series are compact, self contained units. The CX series has a 30°F temperature differential. In order to keep your cellar at 55°F, the area the units is exhausting into should not exceed 85°F, which makes interior installation ideal for all CX units. The 45° angle fans help circulate the cellar air efficiently and allows the unit to minimize it's run time. Made In The U.S.A. Installation Kit: Screws, drain line, insulation, flanges. Does this unit require a drain hose either inside or outside of the unit? BEST ANSWER: Yes - you will need a hose. I use it in a barn and even in super dry conditions it creates moisture - in a month I get about 20 gallons of water in 2 months that I drain into a big trash can and re use that water outside. If this is for an inside application - I would hose out to a french drain or the like. Yes. The drain hose can be on either inside or outside. I put mine on the outside for now, but I might move it inside to increase humidity, since I live in a dry climate. Yes. I have it draining to a container in the cellar to retain humidity but you can set it up to the other side if you prefer. Yes, you will need to run the drain line. It comes of the rear of the unit. The unit requires a condensation line. Where it drains to is up to the installer. Yes, this does require a drain hose. Can I rear duct the exhaust of the CX 3300? Need to vent the exhaust to another room about 5 feet away. Thanks. BEST ANSWER: Good morning Dennis,You should be able to vent 5ft .do not use more than 2 elbows measure the coil opening and match that with the pipe size. 9 or 10 in. should do fine. hope this helps, Carl. Hi you can but remember you will need the to take in a fresh air source from the adjacent room that is under 70 degrees for unit to cool room properly. Can this vent into a mechanical room (furnace and hot water heater) that is 10x15 ft? My cellar is the size of a closet. BEST ANSWER: I'm a wine lover and also a builder. I would NOT vent the unit into a confined space. My unit generate so much heat that it has raised the ambient temp in my whole house basement by several degrees. if you have a crawl space or basement just vent it there. I do not see why not, although the unit is going to produce heat and there is a condensate line that needs to have somewhere to drain. I dod not see any reason the additional heat will cause any issues. I also have a closet sized cellar and my unit vents into another larger closet right next to it with no problems. The vented air is warm, but it doesn't cause any issues for me. If you are venting to a direct adjacent space that is equal if not larger than the cooling capacity of the system to space which would not get over 80 degrees no issue. I would certainly think so , my cellar is 3 X 5 X 8 and I am vented into the kitchen over the fridge . Does anyone know the noise level (dB) of the unit? Is the noise generally in the wine cellar or on the side where the heat is discharged? BEST ANSWER: I have this unit in my cellar and just took some decibel readings. Inside the cellar when the unit is running it is about 65 decibels, outside the door of my cellar in my house it is abourt 46 decibels and outside where the heat is discharged it is about 56 decibels. Hope this helps. It depends on the unit you pick. For example the CX2200 is 55 dB and the CX8800 goes up to 101 dBs. You will hear noise both in the wine room and where your exhausting to and the it will be louder in the room you are venting to. I don't know the specific noise level, but I wouldn't call it "loud". My cellar is below the dining room and I can't hear the cooling unit in the room. Both sides of the unit make noise. outside. Much louder than I thought t would be. On both sides, in the cellar and outside. I need a replacement for the Vintage Keeper Tuscany InterKool 300, which is 15"Hx14"Wx15"D (although deeper is no problem, just the opening of about 15 1/2"H x 14 3/4"W). It is a small cellar that is less than 200 cubic feet that came as a kit, holds about 1100 bottles and is vented into a 10X10 foot room in the basementinto the room. Is the CellarCool CX 200 a good replacement option? BEST ANSWER: Ellen I have a CellarCool CX 200 in a converted cedar room in my garage. The size of the room is around 10x12. Temps can get to 90 degrees in the summer and the CX 200 does a more than adequate job in keeping the room at the desired 60 degrees. Hope this response is helpful. I installed a CX 2200 in a 135 cu.ft. cellar. It vents into a large area under the house which has some louvers to the outside. It has worked great - keeping the cellar at 55 degrees. The fan only runs when the unit is cooling. The operating manual doesn't specify a minimum size for the "vent into" area, but I expect that you will notice that your 10 x 10 area will get warmer when the unit is operating. We ordered this several years ago for a similar size and performance need, and are very pleased with it. It does need a sink or drain on the outside of the cellar room. I would say "yes" - my cellar is larger than yours and vents into a similarly spaced room, and works very well - go for it! How large should exhaust or hot air room generally be for the temperature differential? Any through the wall system needs to vent to an interior adjacent space that is larger than the cubic rating that is listed for the unit. Does power cord location "front (standard)" mean the cool side or the warm side? BEST ANSWER: Yes, the power cord is located on the cool side, which is the front. The front means it is going into the wine cellar. Do you have a version that can run on 220V AC supply? BEST ANSWER: CellarCool CX line is available in 220V power by special order only. Any reason a cellar cooler would not work in an old cedar closet that has been converted to wine cellar. Specifically, if I left cedar walls in, would that would be compatible with my cellar cooler? BEST ANSWER: The Cellar Cool would need to go through the wall and vent into a larger interior space. The size of your room and how it is built with vapor barrier, insulation, exterior grade door etc. will determine whether this cooling unit is the right size. Cedar is not a good wood to use for wine cellars as it is very aromatic and can be toxic to wine. You will be just fine leaving the cedar walls in. There is no reason it shouldn't work. Can this be used in a under stairway pantry. In south. Florida. Vented to the 24" tall space between the first and second floor. How important is it to put the vapor barrier in as the room is already drywaled and finished. The room is approx 150 cu feet. Ideally these should be mounted high on the wall. Please give one of our Wine Cellar Specialists a call @ 1-800-356-8466 so they can go over your specific requirements and recommend a cooling system that best meets your needs. Thank you. My wine cellar is a converted coat closet that backs up to my garage. So, the unit would vent into my garage, which can get warm in the summer. What's the risk if my garage gets over 85 degrees? These cooling systems work off a 30 degree temperature differential. So, if it exceeds 85 degrees in the room you are venting into you will not be able to keep the desired temperature of 55 degrees in your wine cellar. Please call us @ 1-800-356-8466 if you have any further questions? I live in the mountains. In summer the exterior temperature rarely exceeds 85, so the unit should be able to cool effectively. In the winter the exterior temperature can be as low as -10 degrees F. Should I vent this unit to the outside given winter temperatures? Or should I vent it into the room containing the cellar? Does the unit only cool, or will it actually warm the cellar should the temperature become too low? This unit should only vent to an interior adjacent space that is at least 265 cuft. and does not exceed 85 degrees. It sohlud not vent outside. The unit only cools. Can it vent to the outside in Arizona where it might be 100+ in the summer? I have owned a wine cellar for many years. I bought a Breezaire originally and have replaced it a few times. I thought about getting a different brand but none of them fit my opening, till now. Adam recommended a Cellarcool stating that his customers are having good success with the product. So i gave it a try. the unit is doing a great job cooling my cellar. it is quieter than the other units, its nicer looking and runs less often. The guys at the wine enthusiast seem to know their stuff, i trust their judgment. Easy to install and seems to perform well but is more noisy than I anticipated. 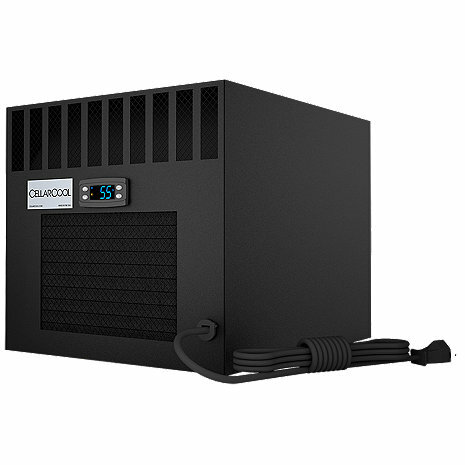 The CellarCool CX 2200 is very quiet and very efficient. When it is on you barely hear it. It doesn't run often as I have my cellar in the basement with poured concrete. So far it has worked tremendously. This cellar CX 2200 unit I purchased works great. Maintains a constant 57 degrees for me, and I am sure anything you set this on will be maintained. The unit also removes a great deal of condensate water, about a gallon each two days, during the summer. Unit is in the basement, so humidity is present. Highly recommend. If it just works more than 2 years? It took a lot more work to fit in existing hole. The bottom drain had to be removed, as it wouldn't sit flat on the floor, as installed. We also added a fan in the rear cavity to remove the discharge heat. Hopefully this will make it last? The instructions were simple to follow and the unit was easy to install. The control panel is adequate. A wonderful product. I'm very satisfied with my purchase.